This is a repeat plant from 1997. At that time, the article was accompanied by a grainy black and white photograph. This time the article is accompanied by a beautiful painting by Los Osos resident and CNPS member, Heather Johnson, who has given permission for us to use it in the Obispoensis. 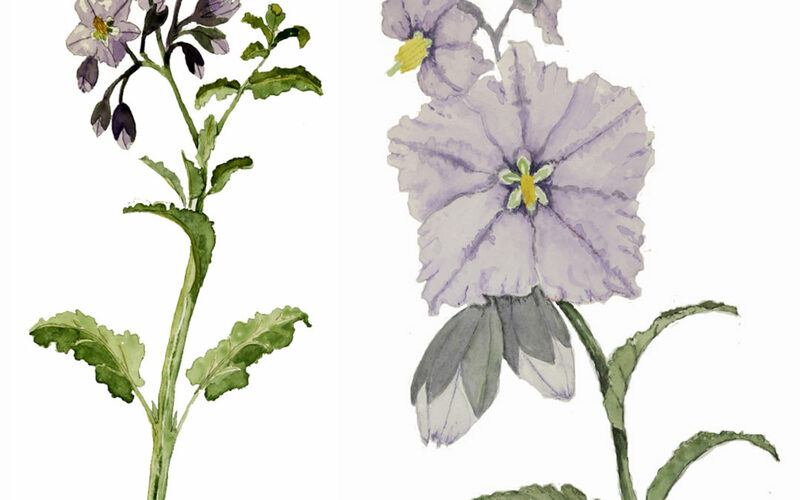 I find it fun to gather tidbits of information about our local plants, especially when it can be accompanied by wonderful art work done by a member of CNPS. Hopefully, others of you, like Heather, will consider giving me a chance to come up with a story about a plant of which you’re fond. Blue nightshade (the name most commonly used around here) is not pushy in its appearance unless it’s in bloom. It is up to a yard tall and the stem is half woody or suffrutescent. The ordinary looking, mostly un-lobed leaves are up to 3 inches long and lanceshaped to oval. Blue nightshade even prefers to grow near other plants and just blend in. It is taking advantage of the habitat created by its often more dominant neighbors. The dominant plant can be considered a kind of nurse plant in that it shelters the blue nightshade by creating an environment that is moister due to the shade it casts. The nurse plant also protects the leaves of the blue nightshade from the drying winds by slowing down water loss from evaporation (transpiration) from the plant’s leaves. Look for blue nightshade where a little extra moisture might be expected. It is usually seen along paths. Blue, Purple, Chaparral, or San Diego Nightshade are some of the common names associated with this plant in California. The species extends beyond California into Baja Mexico, Arizona, Nevada and Oregon. Since its flowers are so beautiful, I suspect it has many other names as well. What is the meaning of the common names? There is no problem with the purple or blue names as this refers to the color of the petals or corolla. It’s a common component of chaparral and it ranges south to San Diego and beyond so that the meaning of those names is also obvious. The name, nightshade, however is much more interesting. It dates back at least to Medieval Europe or maybe even to Roman times and refers to the pulling down around oneself the blackness of sleep or death. This is quite appropriate as the Eurasian relatives of the blue nightshade, bitter-sweet nightshade (S. dulcamara), black nightshade (S. nigrum), and its close European relatives such as henbane (Hyocyanus), mandrake (Mandagora) and belladonna (Atropa) are all slightly to moderately poisonous. The green parts of all nightshades contain a cornucopia of poisonous alkaloid compounds. Some compounds such as atropine (from belladona), are still used medicinally today. There are, however, a number of nightshades from other parts of the world that produce edible parts. There are the edible fruits of eggplant (S. melongena) from Africa and the pepino (S. muricatum) from Latin America. The most important of the edible nightshades is the white, Idaho, or Irish potato (Solanum tuberosum) which is native to the South American Andes. Another member of this genus needs mentioning as well. It is another nightshade from Latin America. It’s the tomato or love apple (Solanum lycopersicon). This plant is sometimes put in its own genus (Lycopersicon). It got the common name, love apple, in Europe shortly after its introduction and its use in their gardens for its intricately lobed greyish leaves and biggish beautiful red fruit. The fruit was NOT eaten at that time because it was thought to be poisonous. If one was sorrowful over the loss of a lover, it was said that eating a tomato would end the suffering. My major professor, Dr. Charles Heiser, told his botany class the story of a jilted Italian lover who wanted to end it all so he ate a number of tomatoes. Of course he didn’t die and he found that he really liked their taste. So he started serving them to all his Italian friends and from there comes the association of tomatoes with Italy. Nowadays Solanum is cultivated as an ornamental and is sold where Native California plants are sold. It is especially good as a border plant. It will grow under oaks. It is drought tolerant if shaded and deer resistant due to its toxic qualities. In common with many other members in the Nightshade family, all parts of the plant are toxic, especially the unripe fruit. WikiLeaks reports that the toxicity is from Solanine and glycol-alkaloids, chaconine, and solasodine. There is no antidote for Solanum poisoning! Symptoms include: Cardiovascular system (tachycardia, arrhythmia, and hypotension), central nervous system (delirium, psychomotor, agitation, paralysis, coma, and convulsion), and Gastrointestinal track (nausea, vomiting, diarrhea).